Fascinating storyline. Wish I had time to read such works but it will definitely be put it on my bucket list. 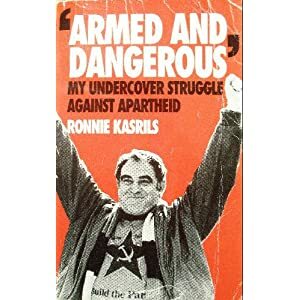 These folks obviously worked with Joe Slovo who, for whatever his faults, I always admired as a tenacious & self sacrificing revolutionary leader grinding away against all odds. Too bad the quid pro quo for ending Apartheid & legalization of the CP there when Mandela took power was the liquidation of socialist revolution & the abandonment of their nuke program. Not that I’m a fan of nukes per se it’s just that N. Korea proves if you don’t want to get invaded in a fortnight by imperialist marauders — they’re nice to have as a deterrent. Then again, if you pose no threat to the imperialist order nuclear aspirations are irrelevant. It’s cruelly ironic that only when the soviets were collapsing was the legalization of the S. African CP possible and the historic significance of ANC & SWAPO would be transmogrified into something like their opposites. I agree. Socially and politically, it’s as if 80% of the USA population had been black at the time of the 1954 Brown v. Board decision. But, notwithstanding the increasing corruption in the ANC, I believe that the lack of progress is primarily the result of private ownership of the country’s productive assets. During apartheid, virtually everything but the farms and the mines was controlled by the government, which provided secure employment for the whites. This ‘socialist’ system was dismantled with the coming of black majority rule. I also visited the ANC headquarters in Lusaka that Louis mentions. In 1989 I was a member of a Namibia election observer team, and we passed through Lusaka on our way to Windhoek. Pallo Jordan received our group and Joe Slovo passed by in the courtyard. I’m honored to have been in their presence.